What is you plan for this trip? My plan is to not be attached to a plan. My mom is a teacher at an international school in South Korea so I was there for a month visiting her and traveling around a bit. And now I have been in Nepal nearly three months, in which time I have done treks and volunteered for ten friends, a small organization out of sisters (my home town). I have been traveling for four months now, and I expect to be traveling for another five months based on my bank account. Why do you enjoy traveling? I enjoy learning abut myself and different cultures. I think it is the best education. What do you plan on doing after your trip? Nursing school. Then hitting the road and traveling as a nurse when I can give back to the places I am visiting. I have always had it in my blood. When I was fifteen I lived in Turkey for a year with my mom as she was teaching in an international school. We traveled a lot together, and from then on,it became part of my life… It is totally addicting. Once you catch the travel bug, it never let’s you go. What do you think of solo travel? I think it is the best way to go. You learn more about yourself and become more independent. You are also more open to whatever the universe presents to you. How is it being a girl in this part of the world? *Whistle* Ummm.. It’s umm… It has been really great in a lot of ways, and had presented a lot of challenges to me. A lot of extreme emotions.. Fear being one of them. It has also taught me to stand up for myself and not be passive. I really love the moment (every once and a while) when I truly let go of any preconceived ideas about anything. Also the adrenaline rush of culture shock, where any ideas you have about human kind or culture are completely shattered, and the previous notions of human nature and about yourself are in pieces. You have to reanalyze everything you ever thought about yourself and who you are. And that’s why I travel, for that shock. Hardest part of this lifestyle? Making true connections with people, and then maintaining them. You can make a strong connection with someone but there is no foundation. What travel advice would you give to your peers? It is the best education that you can give yourself. If you are currently living in a first world country, even just working a minimum wage job, it’s a possible to travel in a third world country. Anyone can do it. So just do it. You can travel abroad in these countries for the price of your daily Starbucks coffee. 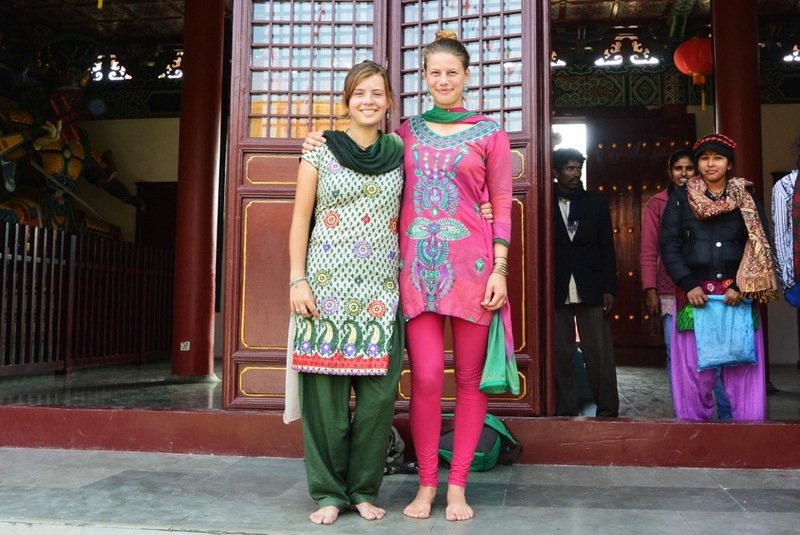 I met Milea, a fellow young solo female traveler, during my vipassana course. Not only did we have those unusual facts in common, but we are also from the same town. Though we had never met before, back in Oregon we live about two kilometers from each other. We clicked right away and I have decided to travel with her (throwing my bike on buses) until she leaves in two weeks for Thailand. This entry was posted in Nepal and tagged Fellow wanderer, interview, Nepal, solo girl, traveler, traveling by The Wandering Nomads. Bookmark the permalink. “There are no mistakes, only lessons.” – yes. Also, people who never venture into making a mistake I have trouble trusting to make the right choice at the critical moment.